It is a very unique and special therapy to support and recover human immunity and self healing systems. This amazing therapy is said to be developed in Japan over 70 years ago by several scientists specialized in the field of bacteria and fermentation. Since then, as one of the complementary and alternative medicines, the rice bran enzyme bath (called “komenuka kosoburo” in Japanese, “kome” for rice, “nuka” for bran、and “koso” for enzyme, “buro(furo)” for bath) has been known among people, even quite limited in number, for its miraculous power of enhancing immunity and self healing systems of a human body. The rice bran enzyme bath is totally different from a normal bath that we usually image about. And also this is not the same type of bath as a cedar enzyme bath which is becoming popular in the US. Instead of warm water, or finely shaved cedar chips, the bathtub is filled with 100% “komenuka”, rice bran only. The rice bran used for this unique bath is dried remainder of raw rice bran after its oil has been extracted to produce edible rice bran oil. The tub is a stout rectangular wooden box sizing 1 meter wide and 2 meters long with its depth of about 0.6 meters. Around two thirds of its depth is filled with the komenuka. The komenuka inside the tub is normally heated up to 65 to 69 degree centigrade by fermentation caused by thousands kinds of active enzyme produced by the various kinds of innumerable bacteria living there eating komenuka, drinking water and breathing air just like other visible creatures. Therefore we also could say, the tub is filled with useful bacteria, enzyme and various nutrients originally contained in komenuka itself, protein, vitamins, minerals and some other unknown substances if any. 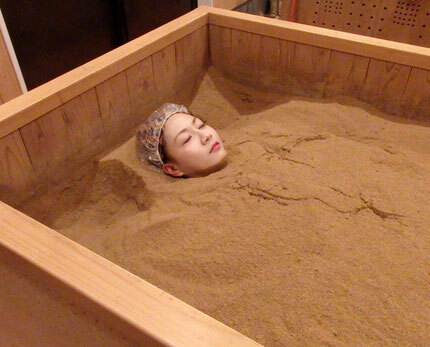 First, your attendant by the tub digs a flat hole, shaped a sleeping bed, in the warm komenuka tub, where you, undressed, lie on your back after he left the room, and cover your private parts of your body with the komenuka stacked up on your sides. Then, you call him back and he buries the rest up leaving your face uncovered (sometimes even the face may be covered with the warm komenuka if you desire!) You lie still in the komenuka bed usually for 15 minutes or more by your request according to your body temperature rising. After the bath, you directly proceed to the shower room to wash away the komenuka stuck to your body. You need not to brush off the stuck komenuka before shower. During such process, what happen to you are: First, the heat generated by fermentation which actually is far-infrared rays, reaches deep inside your body. Second, the above mentioned substances, enzyme and others get into your body through the entire skin surfaces. Some people might wonder if such substances go through the skin, but we should understand any substance (either good or bad) is easily allowed to penetrate in our body and even into the cells if its size is small enough down as molecular level. Just think of a man working in a contaminated environment, such as in a chemical factory without wearing proper protective measures. The chemicals flying in the air easily reaches to his skin through his working clothes and get in his body which sometimes cause cancer in the skin or even in some internal organs. When the infrared rays of 65 degree centigrade heats up your body, your autonomic nerve system accelerates blood circulation increasing the pulse, widening the blood vessels and starts perspiration to cool down your body maintaining its temperature within the acceptable level. The enzymes and other substances penetrate the skin and get in the blood circulation through the capillaries under the skin and finally reach all the cells of your body. If some cells of some internal organs are short of enzymes, this process helps them to recover their normal activities enhancing metabolic process. Perspiration has another important role beside temperature control. We may regard it as the second exhaust system next to the urinary system. These two exhaust systems are somewhat different in their functions. While in the urinary system, its main function is filtration of blood eliminating excess product by metabolic process and excess substances in blood. In perspiration, as you may judge by analyzing sweat, much more toxic substances such as artificial chemicals, toxic minerals, and their compounds are exhausted. Because the human cells have no DNA to produce enzymes to deal with such substances, they must be thrown away by sweat without resolution. During the 15 minutes, totally buried in the komenuka, all those functions occur at the same time and move your body (and even your spirit!) toward the same favorable goal of enhancing self healing and immune systems. First, your body temperature goes up to over 37 degree centigrade. Second, blood circulation gets accelerated to its maximum. Third, perspiration starts throwing out toxic substances. Fourth, enzymes get in your body gradually starting to support the activities and metabolism of the cells. Your internal enzyme often tends to be heavily consumed by mental and physical stress, chemicals, excessive drinking and eating, smoking and so on. In addition, through aging, ability and speed to produce enzyme goes downward. On the other hand, today, minerals contained in food fall short due to excessive use of agrichemicals, which kills bacteria in the soil, and artificially synthesized fertilizers, and refinery through production of processed food, which removes minerals. As the result, most people today tend to fall short of minerals. Since minerals are vital material of enzyme, we, living in modern cities, are all short of enzyme to some extent, which brings out as the result one of the major causes of immunodeficiency. Through regular use of this komenuka kosoburo, you may easily and comfortably maintain your present good health (and fresh skin too!) conditions retarding aging at the same time, and if you are suffering from any chronic disease, you may naturally recover your health without relying on medication which may only reduce symptoms but usually cause serious side effects in a long run. ETIT is ideally effective not only for chronic diseases, but also for any physical injury to the body such as bruise, fracture, and burn, assisting and accelerating the natural self recovery system of a human body. Furthermore, it is observed marvelously effective in rehabilitation after any surgical operation, promoting recovery from damages, preventing infection or metastasis of cancer caused by weakened immunity. It is a kind of protein constructed with a long chain of amino acids. The very complicatedly winding and turning chain forms up a unique shape and its functional sections always carry some atoms of minerals such as iron, copper, magnesium, or zinc. Various compounds of molecules are resolved or synthesized at such sections. This way, under the natural environment, enzyme, working as a catalyst, generates energy or produces each substance required in every step of maintaining life. Without enzyme, none of the metabolic process occurs in the cells. It simply means none of the living creatures, animals, plants, fishes, birds, insects, and bacteria can live without enzymes. An enzyme itself cannot be man-made. Therefore, biotechnology using bacteria such like colon bacillus is used to produce a large amount of enzyme for various industrial purposes. A set of enzyme to support life of single cell bacteria is basically the same as that working in the multi cell creatures like us. That is the way how bacteria in the komenuka tub help us with their enzyme. Owing to the recent scientific researches, almost every chronic disease including cancer and diabetes has been found to be caused by insufficient immunity, “immunodeficiency” in a medical term. In other words, weakened immunity brings about such diseases. When our immune system itself gets depressed, it cannot eliminate every cancer cell which is daily and inevitably born and is allowed to multiply, or we may lose in the battle against lethal germs or viruses. When the system goes out of order and fails to work normally, some group of aggressive immune cells, out of control, starts attacking our normal cells. This leads to varieties of so-called “self immune disease” such like atopic dermatitis, asthma, rheumatism, collagen disease, diabetes, abnormal hormone secretion and many other disorders of internal organs. The human immune system is under control of the autonomic nerve system linked to the brain, thus various constant stresses (mental and/or physical or both) are supposed to affect immunity.